What Auction Length Should You Choose When Selling on eBay? 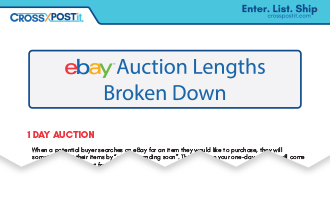 eBay has several auction lengths you can choose from. Sometimes it can be confusing or overwhelming. Did you ever wonder what the best length is to choose for the item you want to sell? This guide will break down each type of auction so you can make better decisions to sell your items more effectively. What types of items are best for 1 and 3 day auctions? When should you choose a 5 day auction? Which auction length is most common?